A balance between preexisting and new at the Berlin Olympic Stadium. 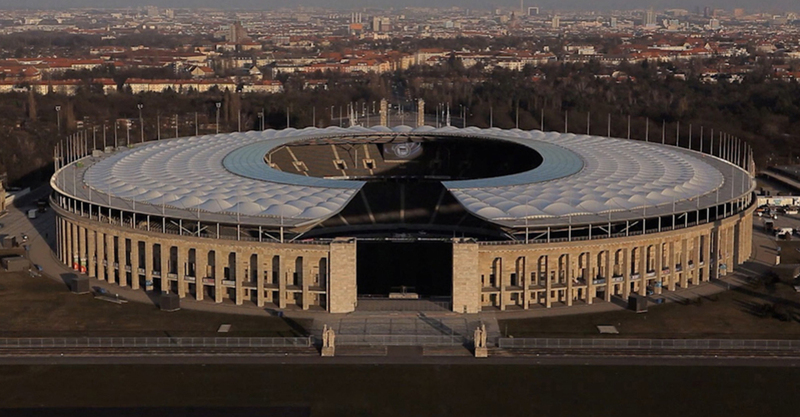 The renovation of the Olympic Stadium in Berlin merged historical preservation requirements, careful modernization and contemporary requirements for a multifunctional use. In 1998, GMP won the competition for restoring the building. The short film by Hans Georg Esch, Oliver Schwabe introduces the project and shows how the preexisting and new additions stand in a good balance and synthesis. The master plan proposed by Werner March in 1936 remains under urban historic preservation. All additions have been placed underground and outside of the stadium to prevent obvious visual intervention to the stadium's graceful appearance. The new roof structure, with its open-ended ring towards the Marathon Gate, sets itself apart from stadium typology with its simple construction and choice of surface material. The roof is designed as a light cantilevering steel construction with an upper and lower membrane. From the interior, the roof rests on 20 steel columns, which each have a slim profile of 25 cm in diameter. The camera approaches the building and reveals its quality by means of frontal frame and dolly move. Empty at first and revealing its monumentality, the building is filmed during a sport competition in the end of the video.